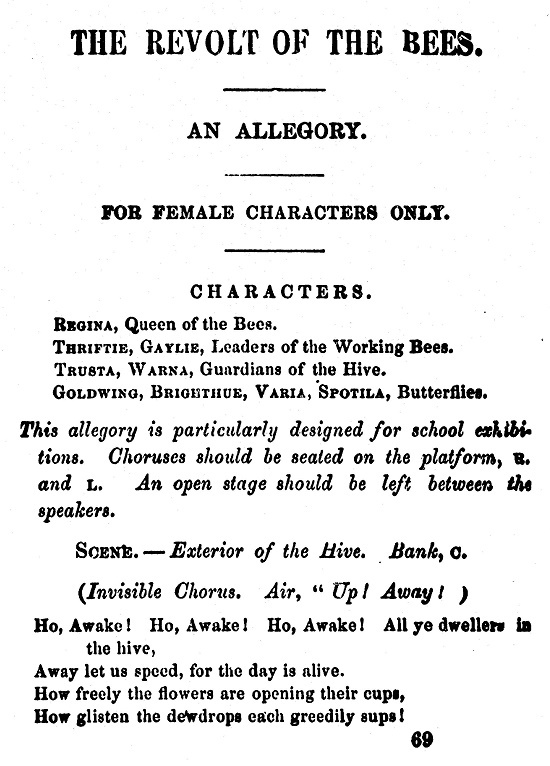 This month’s release of Nineteenth-Century American Drama: Popular Culture and Entertainment, 1820-1900, adds several plays with all-female casts. Three such works are highlighted here. 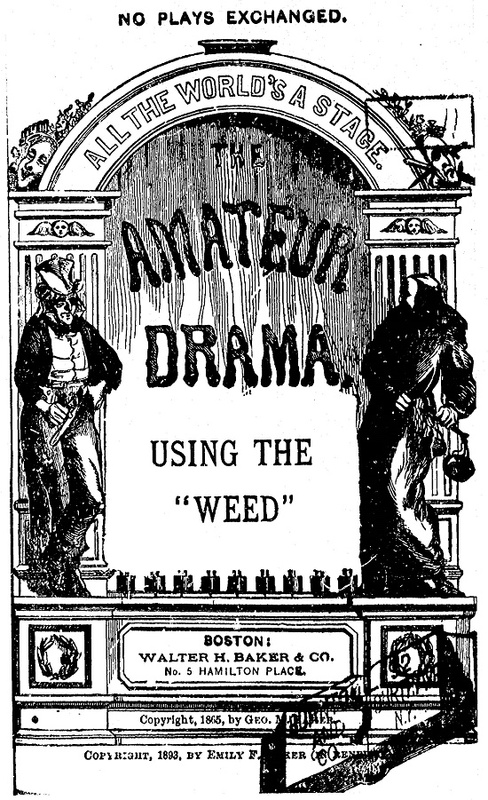 Written by George Melville Baker and first published in 1865, “Using the ‘Weed’” takes place in a small boarding school for young ladies. There are seven characters including Miss Betty Bookworm who is the principal of the school, her assistant Mrs. Starch, three young ladies, and the twin sister aunts of student Clarissa Harlowe Smithers. Mary. I declare, Clari, you will wear yourself out at the sewing machine. Fanny. Your devoted attachment to that useful but tiresome instrument is really surprising. Clarissa. Law, girls, I shall never tire of it. You know it is a novelty to me. Fanny. Novelty! Why, I imagined there was not a family in the world without one. Mary. Mother has had one ever since I can recollect. Fanny. 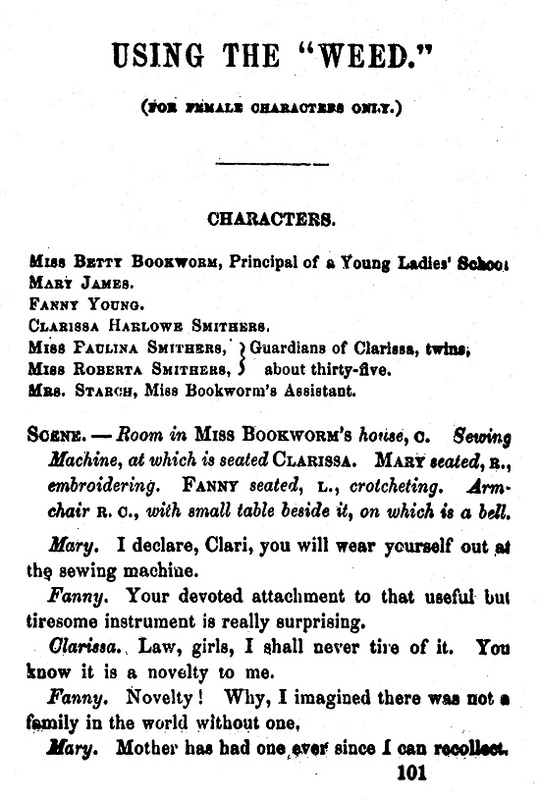 The idea that a young lady, with such a romantic name as Clarissa Harlowe Smithers, should become such a devoted slave to the needle and treadle is very surprising. Clarissa. Romantic! There’s nothing about me romantic except my name, and I’m not to blame for that. You know, girls, that I lost my father and mother when I was very young; and in the distribution of property occasioned by their decease, I fell to the lot of a couple of spinster aunts. I believe my name was originally Clara; but by them I was rechristened, and made to answer to the absurd name of Clarissa Harlowe. The old fussies! Beautiful creatures! It is such a privilege to guide their tender steps! (I wonder why Mr. James don’t send the money for Mary’s last quarter!) So congenial to my cultivated taste to nurture these youthful aspirations! (If Mr. Young doesn’t pay up more promptly, I shall send that girl straight home.) So sweet, so tender, so respectful! Miss R. Stark, staring crazy! Miss P. Smithers should be in such a place as this! Roberta, I smell a pipe! It’s horrible. Miss R. I smell tobacco! Vile tobacco! It’s awful! Among the many accomplishments taught by Miss Bookworm, I have learned to use the weed. Soon all is put to right. Clarissa admits her joke and reveals the sewing machine built by the Weed Company. All is forgiven, and the aunts accept Miss Bookworm’s invitation to stay a few days and observe the school. Julia. Mamma something tells me that we shall have good news. 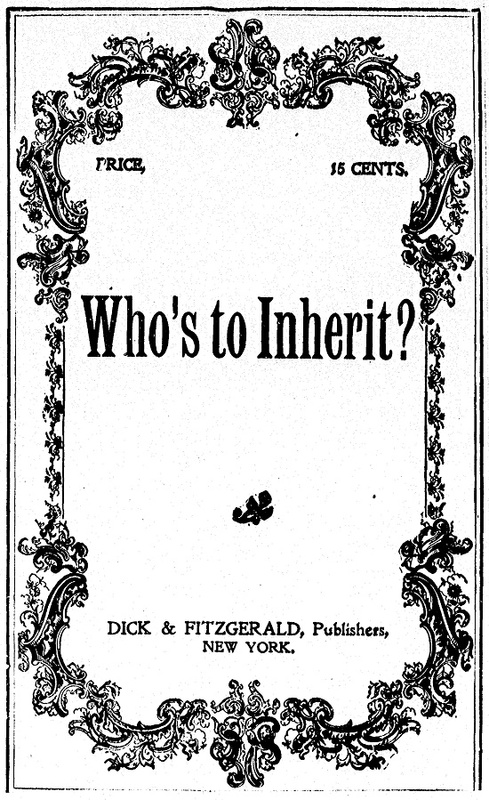 Suppose, now, that grandpapa Annersley should have forgiven you having married his son, and pardoned me the crime of being that son’s only child. And suppose, dear mamma, he should leave us money enough to return to our pretty Devonshire cottage, with our dear old Margery, and a pony carriage in which I could drive you about. How delightful that would be! Julia. My education, mamma! Indeed, I think it is pretty nearly finished now. Besides, how unremitting you have been in teaching me. Everybody is surprised when I tell them I am entirely indebted to you for all I know. Mrs. A. It is merely in useful knowledge that I have undertaken to be your instructress. Remember, in how many accomplishments a young lady is now required to excel. Julia. Indeed, mamma, I do not forget. She must be a musician, an artist, a linguist; she must paint, draw, converse fluently in three European languages, at least; understand Latin, Greek, and algebra, combined with Berlin-wool work and embroidery, dressmaking, millinery, short-hand, and arithmetic, besides being conversant in all ologies in existence. The result of which abundance of knowledge and accomplishments made easy, is a species of patchwork spattering, warranted to be both useless and uninteresting. They are soon informed that they were not mentioned in the General’s will and that Mrs. Annersley’s yearly pension will be terminated. Hence, they are soon to be evicted from their apartment for inability to pay the rent. When they are confronted by the landlady she expresses shock that they can neither pay nor vacate and calls for Margery who proves to be antagonist. Marg. Well, Mrs. Hodgkins, and what’s the matter now, I should like to know? Mrs. H. Those people, there—that woman and that girl! Marg. Tut; tut! keep a civil tongue in your head, Peggy Hodgkins. What do you mean by people, forsooth? Recollect that Mrs. Annersley, bless her! is a lady, every inch of her; and so is Miss Julia. And sure any one that would say the same of you would make a mighty big mistake. Mrs. H. Upon my word, ma’am! Mrs. H. A lodging-house! you vulgarian! this is an establishment! Marg. Oh, very well—an establishment then, if you like! (And we shall have old Johnny, round the corner, calling his baked-potato stand an “establishment,”) But my real lady there did you honor, even to set foot within such a trumpery, furbished-up place; so be pleased to remember, ma’am, that you and I have been fellow-servants in the old general’s family, where we eat his bread and took his wages for many a long year, and I’m ashamed of your want of manners—a pig would behave better. 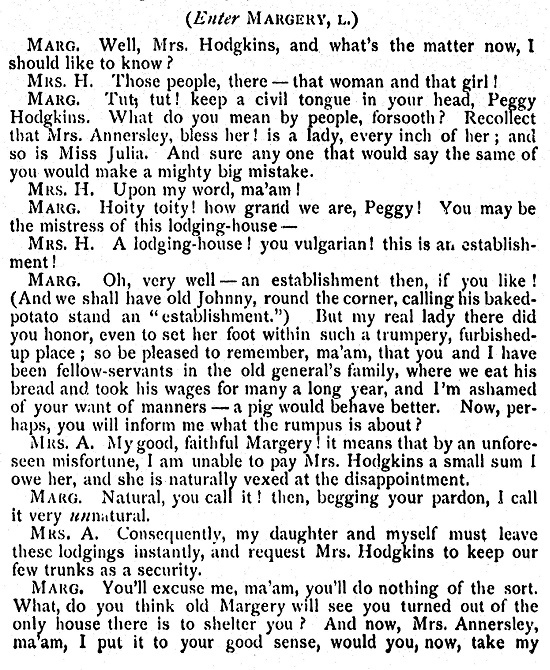 Thus, the battle is engaged as Margery forcefully advocates for Mrs. Annersley and Julia while Mrs. Hodgkins resists. Into this battle are introduced Mrs. Manafort, the presumptive heiress, and her toadying friends, Miss Nicely, Miss Chatter, and Miss Pry. Their names are nicely indicative of their behavior. Suffice it to say, there are victims and villains in this tale. With a fairly deft sense of comedy the playwright brings matters to a satisfactory conclusion as Margery orchestrates the conclusion which sees Mrs. A and Julia vindicated and rewarded. Away let us speed, for the day is alive. How glisten the dewdrops each greedily sups! That no unbidden guest may hither stray. Rifle our cells, our treasures bear away. Surely our labor’s not repaid by spoil. In short, a rebellion is instigated and finally put down. The Queen prevails.